Valentine’s Day is one of my absolute FAVORITE holidays, and I didn’t even have this revelation until last year. I was thinking about what my class could do to celebrate the holiday, and in doing so began to re-live my childhood. I discovered that I have the best memories of Valentine’s Day. I was home-schooled (yes, hard to believe if you actually know me) and every year my mom would take me and my siblings to Chuck-E-Cheeses (a.k.a. The Greatest Pizza Place on Earth), where we would meet up with a bunch of other home-schooled kids and exchange valentines, eat pizza, and get a goody bag (this is probably where my addiction to candy first began). Before we went to The Greatest Pizza Place on Earth we had to decorate some type of container/bag to hold all of our valentines from our friends. My mom would save tissue boxes for us to paint/cover in paper/make beautiful. This is exactly what I have my students do! I have saved all of our tissue boxes since the beginning of the year and will have them decorate them tomorrow (Friday). Over the weekend their homework will be to make a valentine for each of their classmates (in Korea, they don’t sell the cute and easy valentine’s they have in the states) . I will give them paper and materials if they need them. It’s simple, it’s easy, and the kiddies love it! Though… I probably love it more. Here is a picture of the box I decorated last year (it’s falling apart a bit, I just had to tape it), I used a small tissue box because I didn’t have enough big ones, but I would recommend a big box for younger students. 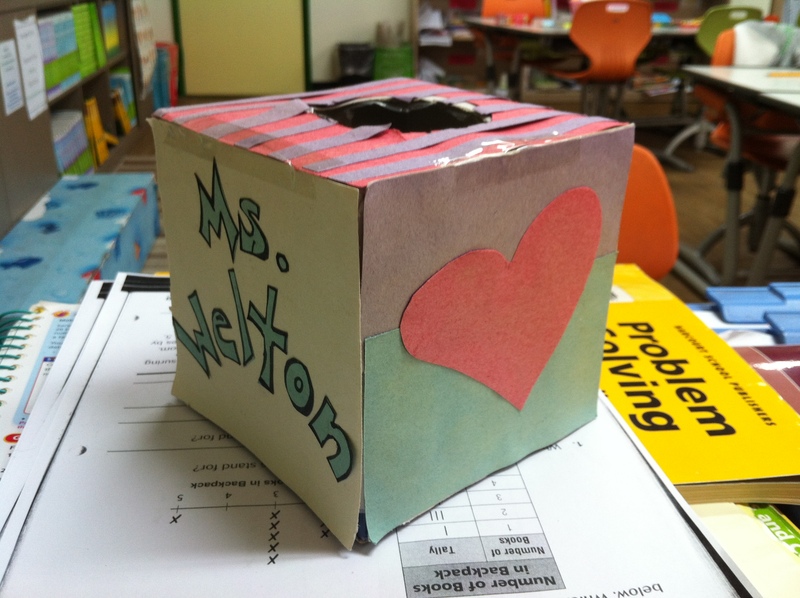 My grade teaching partner uses shoe boxes, which is another great option. I like the tissue box because it already has a hole on the top for the valentines to go in. I saw that on pinterest and really want to do it too!